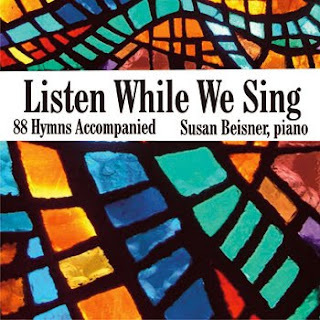 This inspiring 4-CD set includes 88 instrumental hymns played by Susan Beisner on the piano. Each arrangement has an introduction and the same number of stanzas as found in Trinity Hymnal (revised). Arrangements include Holy, Holy, Holy; All Hail the Power of Jesus' Name; Jesus, I Am Resting, Resting and more. I first became aware of the Trinity Hymnal during a visit to West Lake Hills Presbyterian Church in Austin. During the worship service, we sang a hymn whose words were in the bulletin and the reference was to this hymnal. The hymn was only vaguely familiar, but lights went on all over my brain, for it was very beautiful and the words deep and solid. So I found the publisher's website, Great Commission Publications, and ordered the book. I also saw the CDs on the site, and had been meaning to get them for several years. Carol gave me the set for my birthday. They were there in the mail when we arrived home from work yesterday. After supper, we spent an hour or more singing hymns from the hymn book to the marvelous accompaniment of Susan Beisner. When I get to heaven, I'm going to learn how to play piano like that. If I have the time. As one who grew up in a large church during the 50s and early 60s with a "graded choir program" (a sort of cradle to grave approach to sacred music), we were all singers, but some of us (and not a small number) were pianists. There were dozens of pianos around the church, one in nearly every church room where three or more might ever gather. Every age group above early teens had its key board musicians, young people who "took" piano at home from a fairly early age. Pianists raised on the hymns were very, very special. They produced joyful improvisations underneath the vocalists, they kept time, they hit the keys hard when they needed to, and they knew how to surround gently a struggling, young soloist with assurance. Because the hymns had "verses," sometimes 5 or more, hymnists at the piano gave every stanza its own special treatment, displaying the emotional content of the very important text, so none of it was boring. But never did these musicians claim center stage. They were each in Christian service. Now, however, we worship in an era of synthesized music and praise teams, with even the smallest churches attempting to mimic in worship the mega-productions of the giant congregations. The hymns have been in decline for decades, and the hymn pianists more and more rare. But here is Ms. Beisner, who is simply marvelous. The idea of this collection is so very good. She gives us master hymn playing and we sing back the text, whether at home, in "small groups" bereft of keyboards, or even worship services where the art of the hymn has otherwise been lost. This collection is simply not to be missed.